1. Cemetery record. Ohio. Pickaway Co. Salem United Methodist Church Cemetery. 3. Marriage record. Ohio. Pickaway Co.
4. Marriage record. Ohio. Ross Co.
6. Bible. William W. Crow Bible. Simpson Co, KY Historical Society. 9. Marriage record. Charles Hardy attesting to marriage of Samuel Crow & Polly Douglass, July 5, . 10. Marriage record. William Bundige attesting to marriage of Thomas Crow & Jane Douglass, Nov. 12, 1801.
and Robert Crow & Peggy Kersner, March 21, 1805. 12. Marriage record. Andrew Baker attesting to marriage of John Crow & Elizabeth Brittain, 2nd June 1796. 13. Will. 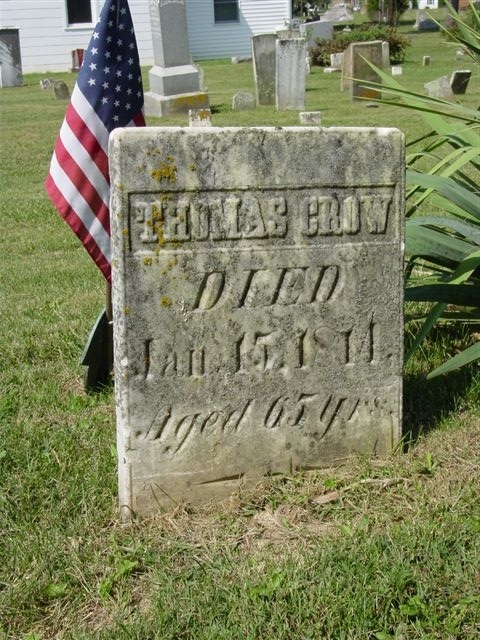 Thomas Crow. Pickaway Co. OH, 24 Jan. 1812. 14. Will. Sarah Crow, Champaign Co. OH , Feb 19, 1821. 17. Census. 1850. Pickaway Co., Pickaway Twp, OH, p. 511. 19 Sept 1850. 18. Census. 1860. Pickaway Co., Pickaway Twp, OH, p. 205. 20 July 1860. 19. Bible. Joseph Crow.. n.d. 4p. 20. Will. Samuel Crow. Putnam Co, IL, 4 Sep. 1838. 21. Will. Sara Crow. Champaign Co, OH. 19 Feb 1821. Marriage and Death Records – Microfilm (1852-1910). Microfilm rolls #994027-994058.
his wife when Thomas Sr. buys land from his sons..
Virginia, 1780- 1872. 1984: Historical Society of Washington Co.
Where/when did John, Susannah (Fielder), and Mary Rush (Fielder) die? Need documentation for death of Samuel Crow.in Putnam Co, IL. What is the relationship of Elizabeth Connelly (w/o Thomas) to Mary Connelly (w/o David)? 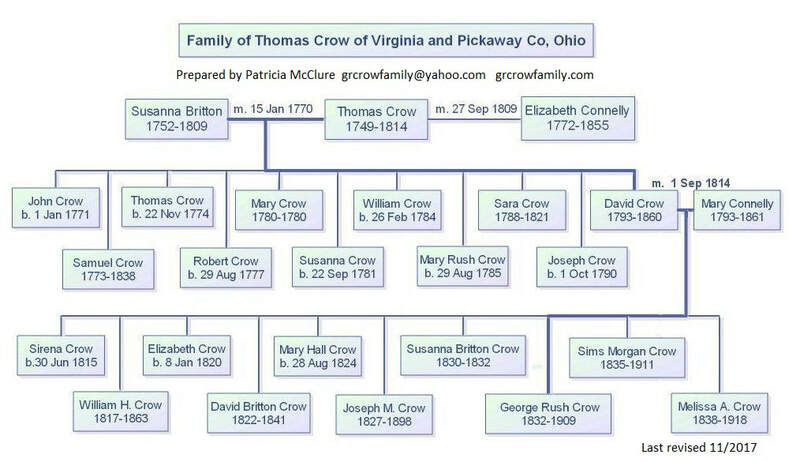 Update: A fellow researcher has let me know she has an old family tree that states: After the death of Susanna, Thomas Crow went back to Virginia and married Elizabeth Connelly. She brought her youngest daughter Mary Connelly with her to Ohio. 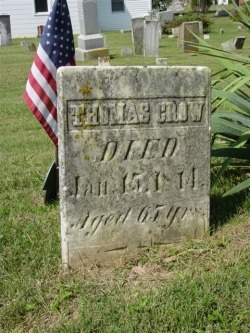 Mary later married David Crow, youngest son of Thomas and Susannah Britton Crow. I think this is very likely the truth but there is still no primary source documentation.